The recent inaugural flight of Boeing’s new 787 earlier this week and this TV season’s new show “Pan Am” have prompted me to search my photo archives for old negatives in order to post an amusing story from my college years. 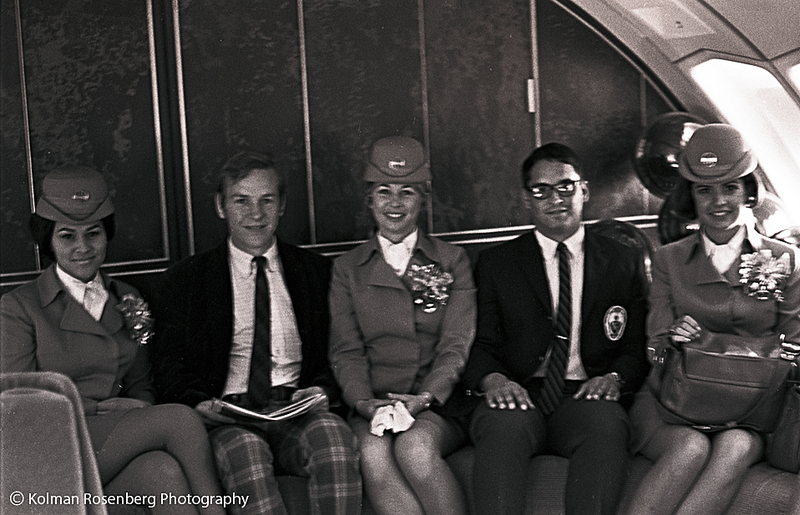 Back in 1969, while serving as a photographer for the Miami Hurricane, the University of Miami’s student newspaper, one of the student journalists, Tom “Sully” Sullivan, mentioned to me that Pan Am was doing a media tour with it’s brand new Boeing 747. This new supersized jet had not been put into service yet, but was at the Miami International Airport for tours by the media. We had University of Miami press passes and he proposed that we go to the airport and see if they would allow us tour the 747. We dressed up in order to look legitimate and drove to the airport. To our amazement, we were welcomed along with the rest of the media and proceeded to take it all in despite the fact that our hastily planned adventure would never see the light of day in our student newspaper. Approaching Pan Am's new 747 "Clipper Flying Cloud" at the Miami International Airport in 1969. Tom, who was from Great Britain, and I were in aw as we approached this giant, 2 story aircraft, the likes of which had never been seen before. Once aboard we had to contain our excitement and act professionally while at the same time, on my part getting decent black and white photos while “Sully” asked some probing questions and took notes. 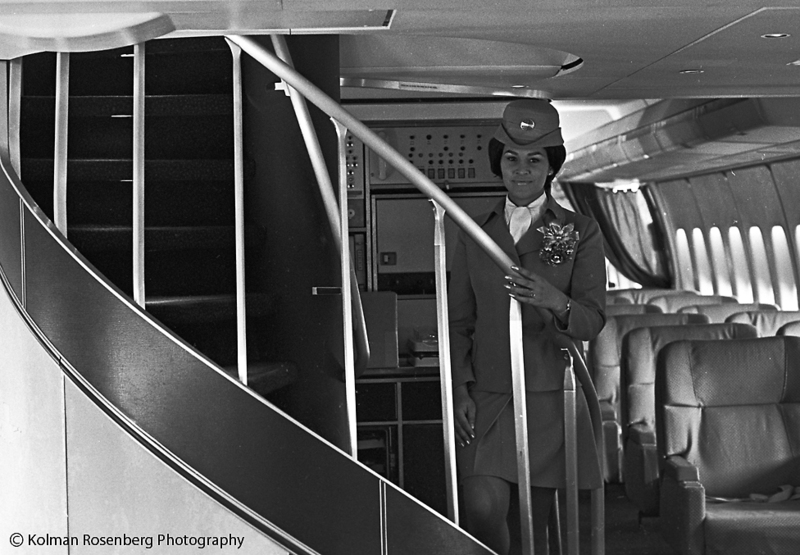 A Pan Am Stewardess poses on the stairway to the 2nd floor lounge of it's first 747. As the new TV show “Pan Am” shows, stewardesses, as they were called in those days, wore very classy uniforms with hats, and flying was a very special activity, not nearly as common as it is today. This aircraft was just amazing with its spaciousness and spiral staircase to the 2nd floor lounge. As our time on the 747 came to a close, we could not resist asking one of the stewardesses to take a photo of us sitting in the lounge with a couple of the other members of their flight crew. I handed my camera over to one of them, sat down and posed for this photo. Sitting in the 747 lounge with fellow journalist Tom "Sully" Sullivan and Pan Am stewardesses. Cameras in those days did not have autofocus, but that’s me on the right in my University of Miami blazer and “Sully” on the left, wearing stylish plaid pants. I believe the stewardess in the center is holding white gloves in her lap. These photos have been scanned from 42 year old 35mm negatives and don’t look too bad given their age. My age on the other hand…………………… It was a different day and time! This entry was posted in Uncategorized and tagged 747, Airport, Boeing 747, Clipper, Clipper Flying Cloud, International, Kolman Rosenber, Media, Miami, Miami Hurricane, Miami International Airport, Pan Am, Pan American World Airways, Press Pass, Stewardess, Tom Sullivan, University of Miami. Bookmark the permalink. What a great story…and photos! Thanks!!!!! I am the stewardess sitting to the far right in the second photo. 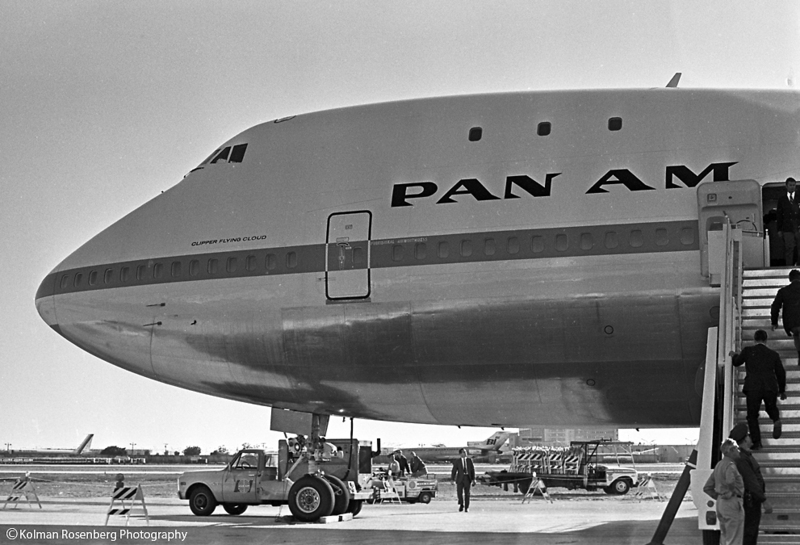 I’ve recently completed a memoir of my time with Pan Am. Do you have any other photographs? (You’re right about the gloves. We all wore them.) I’d love to get in touch with you. Oh my! I am just blown away, I never imagined in my wildest imagination that I would be contacted by anyone in these photos! So that is you by the windows? I recognize the first flight attendant….her name is Rocky Estremeira…she retired several years ago from Delta Air Lines…I flew with her out of Miama/FLL…wonderful lady! Thank you Tammy! I heard from on the other flight attendants shortly after I posted this. It is getting to be a small world when I can learn the names of people from photos taken over 40 years old! Are you still and active flight attendant?